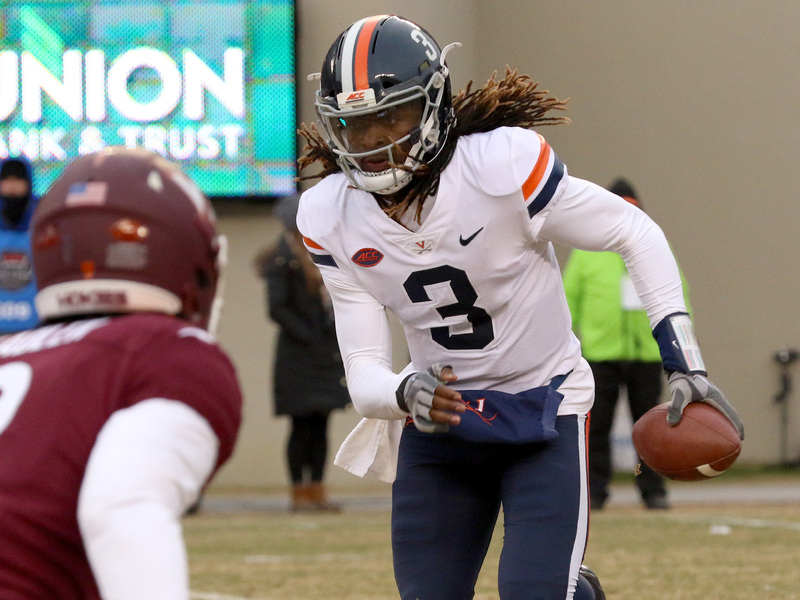 BLACKSBURG, VA – For a few brief moments at Lane Stadium on Saturday night, it looked like the Virginia football team might finally end its long drought against Virginia Tech. Then, just like that, the thirst-quenching oasis on the horizon vanished into the cold, dark night, no more than a taunting mirage. The losing streak reached its 15th year as the Hokies escaped with a 34-31 win in overtime. The Hoos rallied from 14 points down, took the lead in the fourth quarter, and forced a turnover that helped push the lead to seven points in the final three minutes. Just two plays separated UVA from the euphoric ending it so desperately craves, but Tech managed to escape the proverbial jaws of defeat and won the game in overtime. A devastated group of Wahoos tried to explain how they felt after seeing a potential win slip away again. “I’m just upset right now,” Virginia receiver Joe Reed said. “Honestly, losing to Tech, hurts probably the most,” UVA receiver Hasise Dubois said. During this 15-season scourge, Virginia has now lost by a field goal on four different occasions with three of those coming in the last seven years. Three of the last five meetings have ended in losses of four points or less. That includes two of the last three trips to Blacksburg where mere minutes separated the Hoos from a streak-busting win. In 2014, UVA took a 20-17 lead with only 2:55 remaining only to see the Hokies cover 75 yards for the go-ahead touchdown in just 1:07. That near-miss included a roughing the passer penalty and a 50-yard pass completion down the visiting sidelines. Tech capped off the comeback with a touchdown. 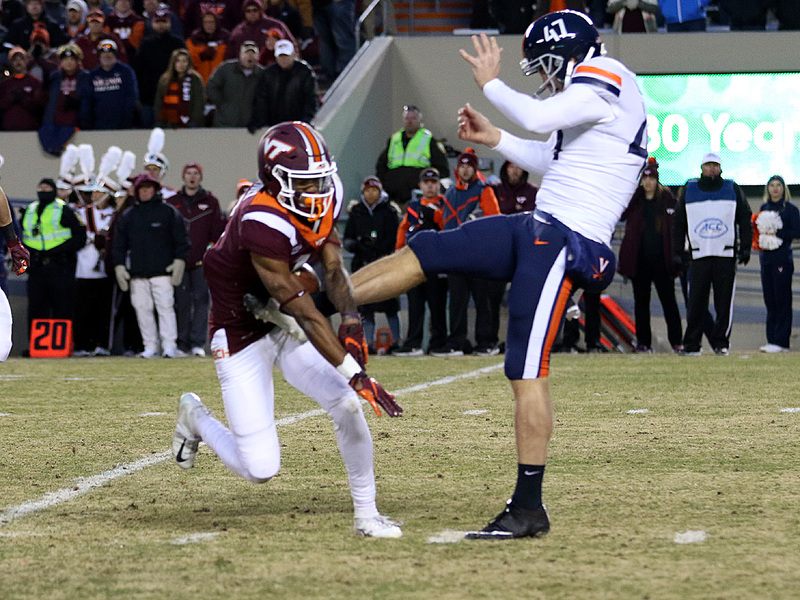 In the 2018 meeting, UVA linebacker Charles Snowden snared an interception at the line of scrimmage that gave his team the ball at the VT 11-yard line. 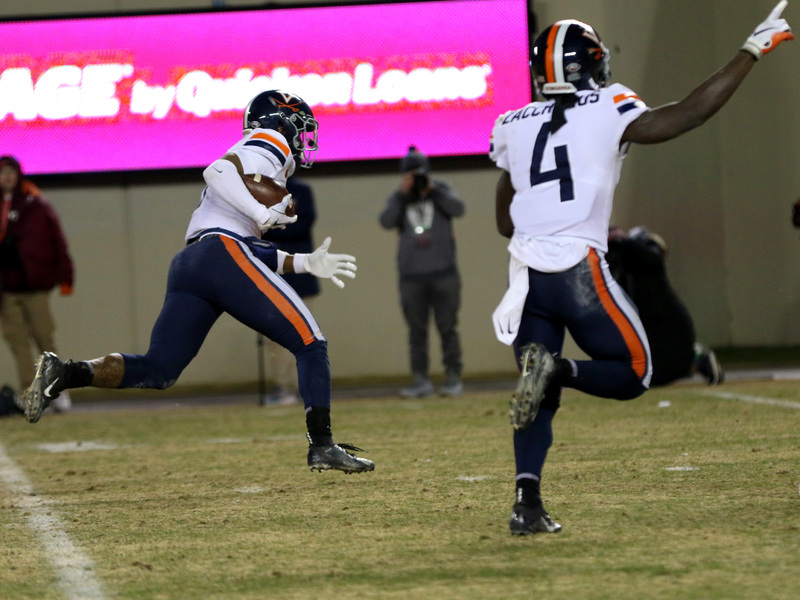 While the offense didn’t get the ball into the end zone – “I was really hopeful for a touchdown there, but I thought the field goal would be enough,” Virginia coach Bronco Mendenhall said – the Hoos extended their lead to seven points when Brian Delaney kicked a field goal with 2:41 remaining. So for the second time in the recent trips to Blacksburg, UVA had the lead with fewer than three minutes to go and the Hokies needing a 75-yard touchdown drive to avoid defeat. On first down, Tommy Christ knocked down the pass for an incompletion. On second down, UVA hurried VT quarterback Ryan Willis into another incompletion. Then, on third down, history repeated itself down the visiting sidelines. Willis lifted a fluttering pass where Cavalier corner Bryce Hall had a chance to make a play, but Dalton Keene ripped away a reception for 45 yards. Two plays later, Tech got the touchdown it needed when Steven Peoples fumbled a carry into the end zone and Hezekiah Grimsley recovered. The score was tied after just 50 seconds went off the clock. With neither team able to mount a winning drive on their final possession, the game moved into overtime where the Hokies had the ball first. The hosts did nothing on their drive with three incompletions, including a key one on third down where Willis managed to avoid a sack under chase from Snowden. That kept Brian Johnson inside of his range and he made the 42-yard field goal. The Hoos had another chance to win the game with their ensuing possession and they ripped off an 11-yard pass play on first down. On second down, however, a faulty read option exchange between Bryce Perkins and Jordan Ellis under quick defensive pressure left the ball bouncing on the turf. VT’s Emmanuel Belmar recovered. That sent Hokie players sprinting around the field and the stadium into jubilation as the streak continued. It also left the Hoos dejected. The ending matched what had been a game full of wild swings. Virginia Tech took the lead late in the first half on a tough touchdown catch by Tre Turner and then added to it moments later when Turner blocked a punt by Lester Coleman and Jovonn Quillen recovered it in the end zone. Mendenhall said a missed assignment allowed Turner to get through and make the block. Trailing 14-0 at halftime, the Cavaliers wasted little time getting back into it. On the first drive of the second half, they covered 75 yards to put their first points on the board. Reed finished it off with a great 29-yard touchdown catch toward the corner of the end zone. After VT responded with a field goal, Reed came through again. This time, it took only one play. Perkins tossed a short pass to Reed outside the hashes on the left side and he avoided the tackle to sprint down the sidelines for the 75-yard touchdown strike. After a 45-yard completion and a 20-yard run late in the third quarter, the Hokies, who had 254 rushing yards, opened the fourth quarter with a two-yard touchdown run to make its lead 10 points again at 24-14. But UVA kept coming back. This time, the ground game got the Hoos to the end zone Perkins tallied runs of 29 and 18 yards before Ellis carried the ball in from 12 yards out for a touchdown. The Cavaliers got the ball back with 10:15 to go and took the lead for the first time in short order. Perkins hit Olamide Zaccheaus with a 36-yard pass and then found Terrell Jana for 11 yards too. The drive ended with Perkins throwing to Hasise Dubois over the middle and he scampered in for a 29-yard touchdown. Add in the late field goal and Virginia scored 31 points in the second half. Perkins finished 14-of-29 passing for 259 yards and 3 touchdowns to go with 112 yards rushing. Ellis added 52 rushing yards and his touchdown. Reed led all receivers with 119 yards and those 2 touchdowns, while Dubois and Zaccheaus had 58 and 55 receiving yards, respectively. “If you look at the plays, it was just routine plays in the second half that we weren’t making in the first,” Zaccheaus said. In the end, the Cavaliers likely will detest the plays that weren’t made, though. The Hoos didn’t put up any points in the first half. A close-call fumble early in the second quarter stopped a drive at the Virginia Tech 12-yard line. Tavares Kelly dropped a slightly underthrown pass while running wide open in the first quarter earlier in that same drive too. In the fourth quarter, UVA held the lead but gained just two combined yards on consecutive possessions in the fourth quarter with a chance to put the game away. Defensively, Tim Harris intercepted Willis on the final play of the first half, but didn’t make it to the end zone after running free down the UVA sideline. Hall couldn’t break up the critical pass play on Tech’s drive to tie the score. Snowden’s near sack in overtime didn’t quite happen. As a result, the Hoos ended the season with back-to-back overtime losses in a span of seven days. Our QB was incredible in the 2nd half with 7 consecutive completions for over 200 yards. Therefore I am baffled why our OC called 5 consecutive futile running plays on the last 2 drives of regulation when a first down or 2 would have run out the clock.